Here’s something to file under “Thank Goodness!” Researchers at the University of Bristol found that people with the genetic variant making them more prone to smelly armpits are also more likely to wear deodorant. The paper, published in the Journal of Investigative Dermatology, looked at variants in the ABCC11 gene that had previously been identified with what scientists describe as “axillary osmidrosis,” known to most people as underarm odor. 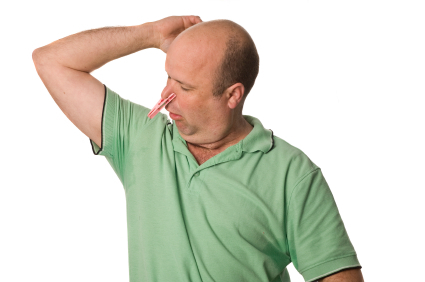 Individuals with a certain version of the single-nucleotide polymorphism (SNP) rs17822931 don’t produce as much sweat as other genotypes making conditions less ripe for underarm body odor. Ancestry also plays a role – a higher percentage of people with East Asian ancestry have this version of the SNP. Fewer people with European or African ancestry have this variant. Since we’re talking about bodily functions we might as well mention that this same SNP is also associated with whether you have wet or dry earwax. While these associations have to do with physical traits, what the researchers in Bristol were looking at was behavior. Specifically, they investigated if use deodorant depended on whether or not an individual had a genetic predisposition toward sweating. What they found was not too surprising: if you have the genetic variant that is associated with more body odor you’re more likely to use deodorant. But the study – which looked at more than 17,000 people – also found that behavior may be explained by cultural influences. For instance, while the percent of women who probably should use deodorant but choose not to was pretty small, a whopping 13 percent of the men in the same genetic boat don’t use deodorant when they probably should. Yikes.